After several bakes on board, I'm nearly satisfied with my bread making, but it's always a delight when a loaf actually turns out better than expected. I substituted 1/8th cup of brown sugar for the 1/4 cup of Honey just to keep my grand daughter interested in the bake. After kneading the dough for 10 minutes with my grand daughter's help, we left the dough to rise and it rose to over double it's size in an hour sitting on top of my cooker (off). Next, I divided the dough into three nearly equal pieces (that's a good game!) and rolled them on a slightly oiled surface into sausage shape about 12" long. Then Platted them, squeezing the ends underneath and placing into a prepared sprayed baking tin. 2nd Rise for 1 hour, heated the oven to 350º F (regular bake, not 'Fan') and baked for 40 minutes. This is definitely doable on the boat. I did not use city water, which probably explains why the rises were so good. It makes great toast but is delicious (Peggy & KT both gave it a 10) and it looks nice. The lower temperature for this bake, 350ºF v 400ºF of my other bakes should make it even more repeatable on the boat. 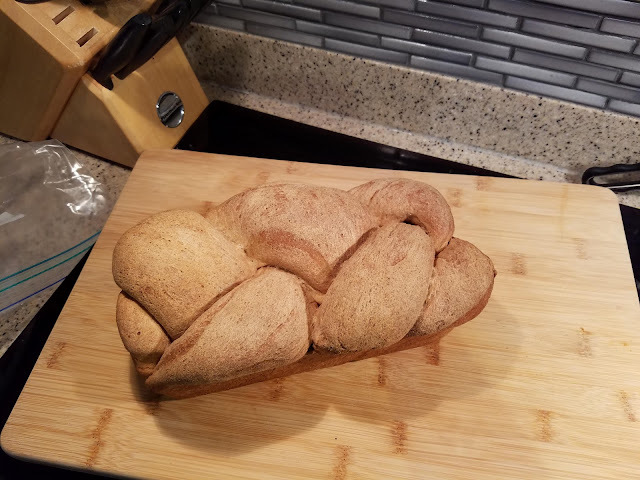 I'll have to try it on a baking sheet rather than in a bread pan, it seems to hold it's shape really well. If you see me on the water, you might come aboard for a snack of Cheese, Grapes and some fresh baked bread. 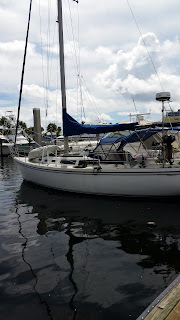 Got questions or suggestions about our boat, our sailing or our adventures?